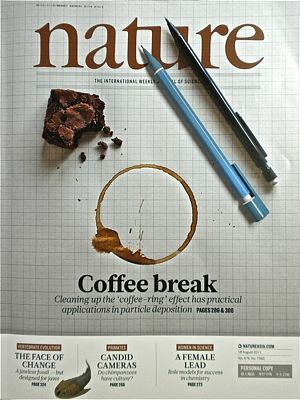 The cover of the August 18 issue of Nature carried a fancy photo in order to symbolize one of the letter report  in the issue, together with the introductory words, "Coffee break: Cleaning up the 'coffee-ring' effect has practical applications in particle deposition." The mechanical pencil in the photo was of nearly the same size as a real one, so that I often reached my hand out to pick it up while the journal was on the desk. To commemorate my repeated mistake, I took a picture of the cover with a real pencil on it. Can you guess which is the real one? P. J. Yunker, T. Still, M. A. Lohr and A. G. Yodh, Suppression of the coffee-ring effect by shpae-dependent capillary interactions, Nature vol. 476, p. 308 (2011).